As part of the $11 billion Metro Tunnel, a state-of-the-art station is being built at the heart of the University of Melbourne's Parkville Campus. With a new metropolitan train station, the Parkville campus will be more accessible and interconnected. The new line and will provide a world-class experience, with ‘turn up and go’ train services that are the hallmark of the great cities such as London, New York, Hong Kong and Singapore. The new station will provide a direct rail connection to Parkville, relieving pressure on local trams and roads, and enhancing access to the University of Melbourne and facilities such as the Royal Melbourne Hospital, the Royal Women’s Hospital, the Peter MacCallum Cancer Centre and the Royal Children’s Hospital. 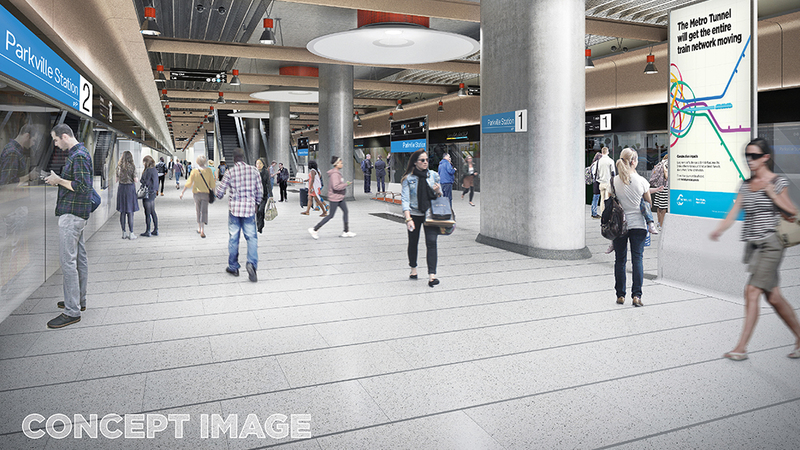 The design of the new Parkville Station and associated works will transform Grattan Street into a ‘grand promenade,’ with one lane of traffic in each direction and wider footpaths and bicycle lanes. 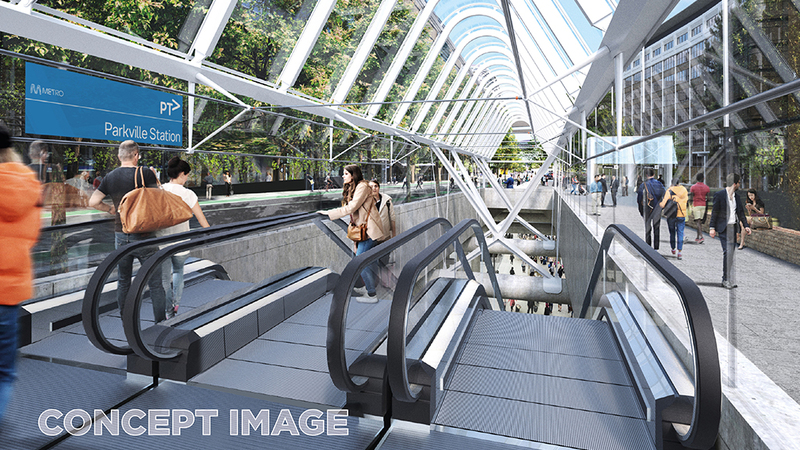 An underground pedestrian link across Royal Parade will further improve connections between the University and partner hospitals and institutions. Rail Projects Victoria is the government body responsible for the planning and delivery of the Metro Tunnel, and Cross Yarra Partnership (CYP) is the contractor delivering the main design and construction works. The Metro Tunnel will increase capacity on Melbourne’s metropolitan train network by creating a new end-to-end rail line from Sunbury in Melbourne’s west through to Pakenham/Cranbourne in the south-east. Twin nine-kilometre tunnels will deliver a new dedicated pathway through the heart of the city for two of Melbourne’s busiest rail lines, diverting these lines away from the City Loop and enabling 39,000 more passengers to use the rail system each peak period. The target completion date for the Metro Tunnel is currently placed at the end of 2025, which accounts for construction works above and below ground, tunnels and stations fit-out, as well as the installation and testing of critical safety systems including the integration of high capacity signalling with existing network systems. The map below shows the configuration of the Grattan Street work site, incorporating pedestrian, cyclist pathways and detours around the site. 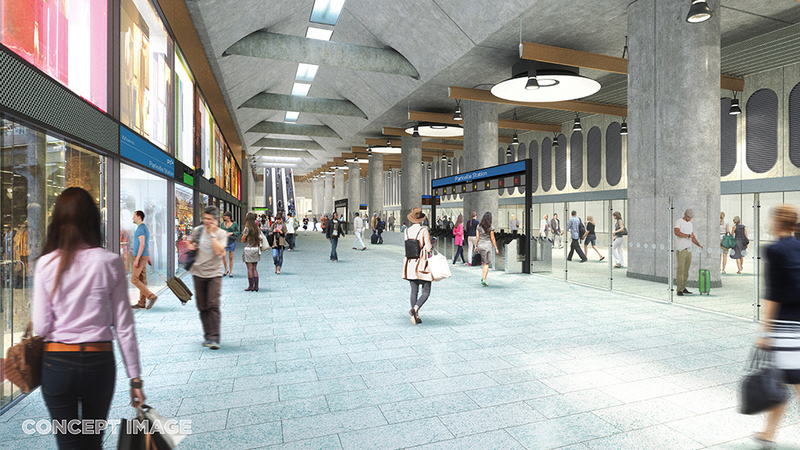 To construct Parkville Station, a 30-metre deep underground excavation will be undertaken on Grattan Street between Leicester Street and Royal Parade. Before excavation can commence, a construction method called piling is undertaken to provide structural integrity and form a retaining wall that enables excavation. Excavation of the Parkville Station site will be done using a construction method referred to as ‘bottom-up’. This means excavating down to the station’s maximum depth, followed by construction and fit-out of the station. The road surface is then reinstated once the station is complete. Piling involves the use of a piling rig that drills a hole using an auger that rotates, much like an over-sized drill bit. The rotation of the auger causes material to move out of the hole being drilled. Once the hole is excavated, a steel prefabricated reinforcement cage is placed within the hole and concrete is the poured into the hole to form the pile. Once the concrete sets, the pile is complete. By the end of the piling phase, CYP will have installed approximately 500 piles around the Parkville Station site perimeter, each to a depth of about 32 metres. As part of the construction of the new Parkville Station, University Square and Grattan St will be 'greened'. New trees and low-height landscaping will provide a green link between Royal Parade and University Square. Barry Street will be landscaped to create a new public space next to University Square ensuring a pedestrian and cycling-friendly environment. There will also be an accessible tram stop built on Royal Parade and University Square that will further improve connectivity. Subscribe to the Metro Tunnel's eNews, to receive regular updates on construction in Parkville and the development of the station. For questions or concerns related to Metro Tunnel Works please contact Rail Projects Victoria’s community information line on 1800 105 105. For inquiries regarding the University of Melbourne’s planning in relation to the construction of Parkville Station please contact the University’s Metro Tunnel Interface Team: mmrp-team@unimelb.edu.au.